T ongue-tied when it comes to spontaneous prayer? Seeking to gain a better footing in your faith-walk? 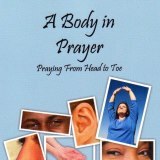 Join author NEIL COMBS on Catholic Vitamin B for BODY – a discussion of Neil’s book: A BODY IN PRAYER: Praying From Head to Toe. Imagine using your whole body to pray. It’s possible and this podcast can be a primer for a revitalized approach to prayer for you – an easy-to-read book which you can use for Lent, during a retreat or for any time you want to start an organic look at your prayer-life. This entry was posted in Podcasts and tagged A Body in Prayer, Author, Neil Combs, Prayer, Vitamin B. Bookmark the permalink.